Express Pegasus is a car passenger ferry operated by the Greek shipping giant Hellenic Seaways. Built in Italy in 1996 it has a passenger capacity of 1518 and can carry up to 200 cars and on each crossing carries supplies for the residents of the islands that it serves. Please Note: Whilst we have taken great care in making our Express Pegasus guide as accurate as possible, onboard facilities, services and entertainment may vary depending on the date and time of year that you travel, facilities mentioned may change without notification and ferry companies reserve the right to operate vessels other than those mentioned at time of booking without prior notification. it is not possible have only 2 ferry at august the 3rd. "it's easy to travel in this way"
we travelled from Skiathos to Skopelos. 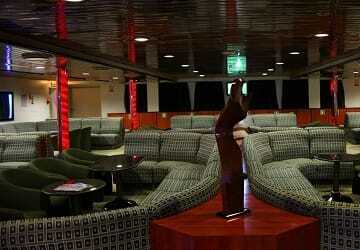 Big, comfortable and clean ship, excellent service on board. People can travel with car on this ferry so the boarding process takes a bit longer, we left the port 1 hour late. "IT WAS NOT PUNTUAL, BUT IT WAS FAST"
As I said last time I booked with you, this is a decent ship for the journey which its used on. Hellenic Seaways know what they are doing on these trips to the islands and the staff look after you on board too. Look forward to the next trip. 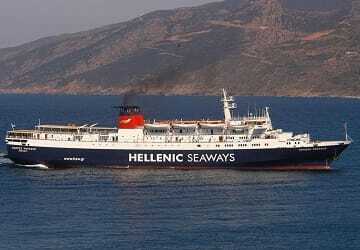 I'm sorry to say, but will not use Hellenic Seaways for Greek islands again. If you rely on other means of transport to get to ports then you run the risk of missing the crossing if their timetables are unreliable. We missed our ferry from Agios Konstantinos because there wasn't an early enough bus from Athens, had to travel to Volos and buy new tickets (€96). So check schedules of buses in advance or buy your tickets as you go instead. "Everything worked out just great!" Starting with the online booking until the conclusion of the trip everything worked exemplary. Bravo to Hellenic Seaways and of course to Direct Ferries too. Top service!